*When thinking of “New Jack City,” Nino Brown immediately comes to mind. For many, Wesley’ Snipes’ portrayal of the ruthless drug kingpin ranks right up there with Al Pacino’s Tony Montana in “Scarface.” While moviegoers got their Nino fix in spades with seeing him on the big screen back in the ‘90s, their first look at the character came courtesy of famed artist-graphic designer Art Sims, the man who created the iconic “New Jack City” movie poster. Looming large over three cops (played by Ice-T, Judd Nelson and “New Jack City” director Mario Van Peebles), Nino commands the spotlight wearing shades in a cloud of smoke with a gun in his hand. 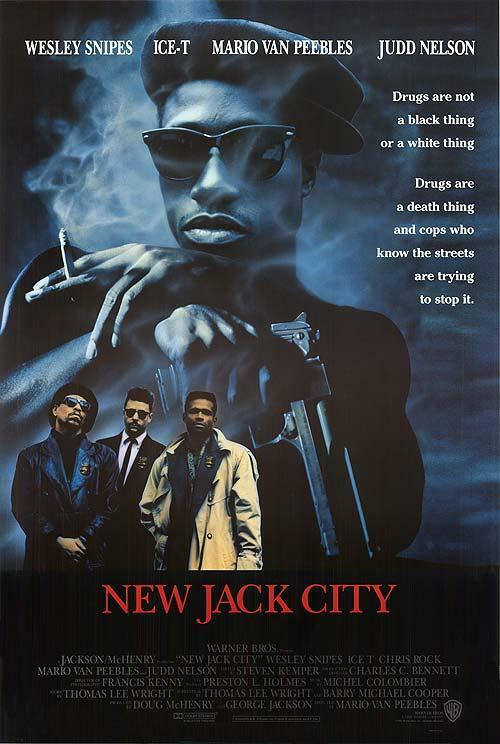 In a time where good guys dominated movie posters, Sims gambled and won big with a different take that perfectly captured who and what “New Jack City” centered on after reading the film’s script. “I knew this was about a guy who was running a crack business and in the most successful crack business in the United States,” Sim told EURweb associate Chris Richburg while recalling Warner Brother’s reaction to what he had in mind. ” I was talking about the ideas and I was showing them to Joel Wayne, the studio’s vice president of creative advertising]. He saw my ideas had Wesley as the large predominant star of the film. He said ‘Alright. You can’t make Wesley bigger than these guys because he’s the bad guy. Despite feeling that making the three cops bigger than Nino was not the way to go, Sims went ahead and produced bigger images of the lawmen in action. The only thing was “they just weren’t powerful enough” for Sims, who fell on his initial idea and upped the ante with a BB gun he had on hand. From there, Sims brought in a model to replicate his pose. 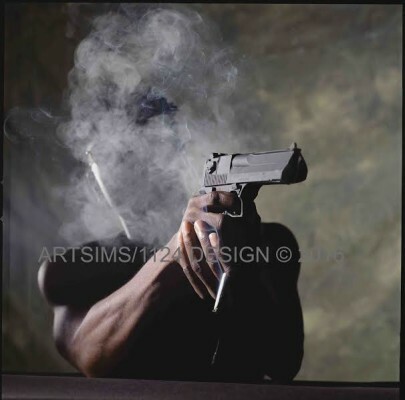 Although Sims was satisfied with his image, Warner Bros. had a different opinion about the thick smoke covering the model’s face. The image above is among the photos taken to help create the iconic “New Jack City” movie poster. Honoring the studio’s request, Sims lessened the smoke and only used Snipes’ head for his picture. The sight of the “Blade” star wearing sunglasses in a “New Jack City” movie photo provided what Sims needed to use a pre-Photoshop method to transfer Snipes’ head on to model’s body, which remained intact. “I just wanted to show in the image the negative of guns and drugs and the guy with the sunglasses. You couldn’t see his eyes, which is by design that it sends a very evil message, a very bad message. That’s why I went with the dark blue [background] to make it dark and kind of evil-looking,”he added while pointing out how Nino’s large size in the poster emphasized his opinion about the cops. 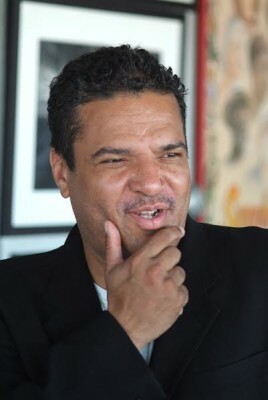 The image above is another photo taken to help create the iconic “New Jack City” movie poster. While Sims got his ideal image, Snipes was not sold on being seen in sunglasses. Snipes may have been a bit of a challenge, but Warner Bros. proved to be a lingering one as Nino’s lit cigarette provided another obstacle as Wayne campaigned for an unlit cigarette for the “New Jack City” poster. 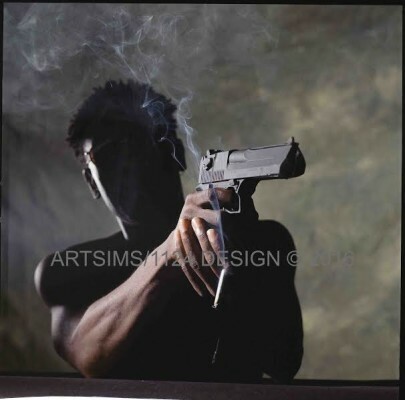 As it turned out, the request proved to be a blessing in disguise for Sims, who discovered the realism the unlit cigarette brought to the picture. In all, the poster took six months to create. On March 8, 1991, “New Jack City” arrived in theaters and became a certified hit. This year marks the 25th anniversary of the film, which is still regarded as a classic in the eyes of many. Although the success of the film and its hit-packed soundtrack were expected, what Sims didn’t expect was for the popularity to bring news coverage and those who wanted the poster for themselves. “I was like ‘Oh my god. Some people liked it so much that they actually went to the bus stop and tore open the [glass case], thinking they could get the poster out. That’s crazy.’ That’s the first time that I ever had a poster that people liked it so much that they actually started tearing open the bus stops to get the poster and it was on the news,” Sims said, noting how the frenzy attracted the attention of director Spike Lee, who couldn’t believe the fan reaction. “And Spike said ‘I can’t believe it. Why are they doing this?’ I said, ‘Spike, it’s is what marketing is, man. Look man. How many times do you see a beautiful image of a brother with a gun that looks so cool that you had to have that?” he continued. Prior to and since “New Jack City,” Sims has amassed a catalog of movie posters, many of which for Lee. Films he done work for include Lee’s “Do the Right Thing,” “Jungle Fever,” “Malcolm X” and “Mo Better Blues” as well as “The Color Purple,” “Love and Basketball,” “King of New York,” and “Red Tails.” These posters are among those featured in “Movie And Messages: The Movie Posters & Early Works of Art Sims,” an new exhibit currently on display at the Maryme A. Clayton Library & Museum in Culver City, CA. Looking back on “New Jack City” and the poster he designed, Sims admits the poster deserves to be ranked among his best, given the public’s love for the image and the film it’s eternally attached to.